Cytopenias are defined as a hemoglobin level below 10 g/dL, an absolute neutrophil count of less than 1,800/μL (see the Absolute Neutrophil Count calculator), and a platelet count below 100,000/μL. A diagnosis of MDS-MLD requires that dysplastic features be present in more than 10% of cells from two or more lineages. There are less than 1% blasts in the peripheral blood and less than 5% blasts in the bone marrow. Auer rods are absent. Cases previously diagnosed as RCMD with ring sideroblasts (same criteria as RCMD but with greater than 15% ring sideroblasts), as well as cases of MDS-MLD with more than 5% ring sideroblasts plus an accompanying mutation in SF3B1 will be classified as MDS with ring sideroblasts and multilineage dysplasia (MDS-RS-MLD) as well as grouped under the heading MDS with ring sideroblasts (MDS-RS) in the upcoming revision of the WHO classification. Cases in which there are findings of MDS-MLD in conjunction with a history of cytotoxic chemotherapy and/or radiation therapy are better classified as therapy-related MDS (t-MDS). Myelodysplastic syndrome (MDS) is an uncommon disorder; it has a higher incidence in elderly patients. Approximately 10-15,000 new cases of MDS are diagnosed each year in the United States, with patients older than 60 years the largest age group affected. The incidence of MDS has been reported to be between 22 and 45 cases per 100,000 people older than age 70 years. Cases previously classified as refractory cytopenia with multilineage dysplasia (RCMD) and RCMD with ring sideroblasts accounted for 26.8% and 12.7% of 1095 MDS cases, respectively, in a 2006 review,  and would roughly correlate with the reclassification as MDS-MLD and MDS-RS-MLD, respectively. The precise incidence of MDS-MLD is not known. As noted earlier, patients with myelodysplastic syndrome with multilineage dysplasia (MDS-MLD) tend to be elderly. Most patients are asymptomatic at presentation, and MDS-MLD is often detected incidentally. However, some patients present with fatigue, easy bruising, or susceptibility to infection related to anemia, thrombocytopenia, or neutropenia, respectively. Laboratory findings include one or more cytopenias, as defined earlier. Other potential etiologies for cytopenias, including nutritional deficiencies, the effects of medications (particularly chemotherapeutic agents) or toxins, infection, immunologic processes, or sequestration, must be excluded before a diagnosis of MDS is considered. If cytopenias are persistent and other causes are excluded, a bone marrow biopsy and aspiration are performed, usually with submission of material for cytogenetic and/or flow cytometric analysis. Morphologically abnormal cells may be seen in the peripheral blood or bone marrow of patients with myelodysplastic syndrome with multilineage dysplasia (MDS-MLD). The morphologic findings characteristic of dysplasia vary depending on the lineage. A diagnosis of MDS-MLD requires that more than 10% of cells be present in two or more cell lineages. This is often best appreciated on bone marrow aspirate smears; peripheral blood and biopsy sections may offer additional information. Morphologic findings of granulocytic dysplasia include abnormal nuclear segmentation, particularly with hypolobated nuclei, including pseudo–Pelger-Huet anomaly with bilobed nuclei in which the nuclear lobes are connected by a fine filament of chromatin. Hypersegmented nuclei may also be a dysplastic finding, although this feature is less common. Other forms of granulocytic dysplasia include abnormalities of the cytoplasmic granularity. 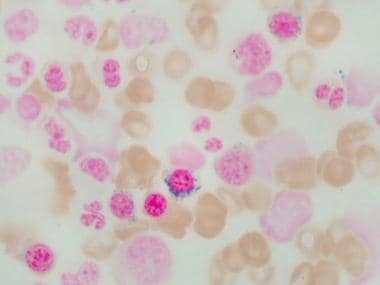 In some cases, the dysplastic neutrophils are hypogranular and the cytoplasm takes on a pale blue tinge (water-clear cytoplasm) (see the image below). Dysgranulopoiesis. Peripheral blood neutrophil with hypogranular, water-clear cytoplasm. In other cases, there is an increase in large, coarse, azurophilic granules (pseudo–Chediak-Higashi granules). Auer rods may also be a sign of dysplasia in the granulocyte lineage; however, the presence of Auer rods excludes a diagnosis of MDS-MLD. Rather, their presence indicates a more aggressive form of disease. Dyserythropoiesis. Megaloblastoid erythroid precursors with nuclear irregularities and a multinucleated erythroid precursor. Dyserythropoiesis. Megaloblastoid change and multinucleation in erythroid precursors. Dyserythropoiesis. Hyperlobation, nuclear fragmentation, and megaloblastoid change in erythroid precursors. Ring sideroblasts identified in bone marrow aspirate. Many blue siderotic granules surround the nucleus. Note also the hyposegmented neutrophils. 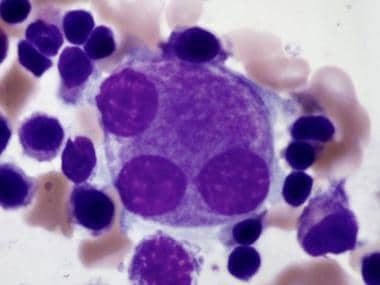 Dysmegakaryopoiesis. Discrete nuclear lobes, or multinucleation. So-called pawn ball megakaryocyte. Morphologic findings of dysplasia may also be identified in histologic sections of the bone marrow biopsy or clot section. The cellularity of the bone marrow is usually normal or increased in MDS, although a form of hypoplastic MDS has been recognized. 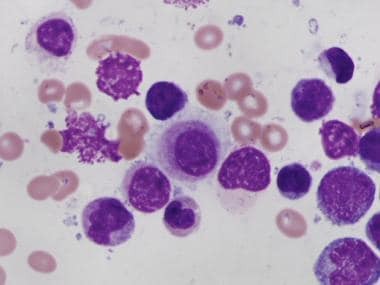 The presence of clusters of immature myeloid elements away from bone trabeculae or blood vessels (so-called abnormal localization of immature precursors) may also be noted, particularly in cases of MDS with excess blasts (MDS-EB). The clinical differential diagnosis for myelodysplastic syndrome with multilineage dysplasia (MDS-MLD) includes virtually any entity that can lead to persistent cytopenias, including congenital and acquired conditions. Non-neoplastic conditions that can present with cytopenias and varying degrees of morphologic "dysplasia" include viral and other infections, nutritional deficiencies, autoimmune disorders, heavy metal toxicity, Fanconi anemia, congenital dyserythropoietic anemia, among others. Cytopenias with associated "dysplasia" can be the result of medications (especially chemotherapeutic agents). 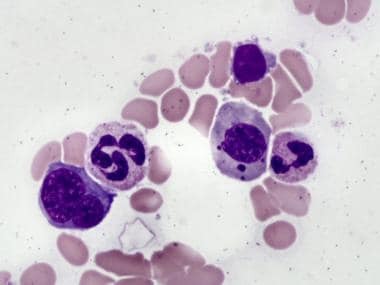 Aplastic anemia also presents with cytopenias and can raise concern for a hypoplastic MDS, but acquired aplastic anemia typically lacks significant morphologic dysplasia and has a normal karyotype. It is important to remember that more than one process affect the peripheral blood counts at a given time. For example, although infection can be associated with dysplastic findings, patients with MDS are predisposed to infection due to the low number of granulocytes. In addition, patients may have an MDS in the setting of a lymphoproliferative disorder. To firmly establish a diagnosis of MDS, other potential etiologies for cytopenias and the morphologic changes must be excluded. Additional laboratory findings that help confirm that cytopenias and morphologic dysplasia represent an MDS include increased numbers of blasts, flow cytometric demonstration of aberrant maturation patterns or aberrant antigen expression (such as lymphoid markers on myeloid cells), or clonal cytogenetic abnormalities. 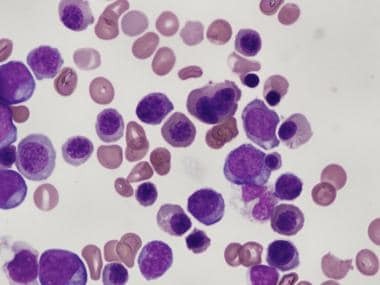 Myelodysplastic syndrome (MDS) has largely been diagnosed on the basis of morphologic and clinical features; in some cases, the diagnosis is supported by abnormal cytogenetic findings. The use of immunohistochemical analysis and flow cytometry in the diagnosis of MDS is an area of active investigation. Some tests have proved useful in establishing this diagnosis. Immunohistochemical analysis of bone marrow biopsy and clot sections has centered on the identification of immature myeloid precursors, or blasts, especially with the use of antibodies to the progenitor cell antigen CD34. It is important to note that CD34 is not expressed in all populations of myeloid blasts, and its expression is also not limited to myeloid blasts: CD34 is expressed in vascular endothelium, as well as in some immature B-cell precursors (hematogones). The precise molecular mechanisms of myelodysplastic syndrome (MDS) are not fully understood. However, in many cases of MDS, there is an increase in apoptosis among bone marrow precursors, which accounts for the ineffective hematopoiesis. Cytogenetic abnormalities are relatively common in MDS with multilineage dysplasia (MDS-MLD); abnormal karyotypes are identified in up to 50% of cases. The more frequently encountered abnormalities include deletions of the long arm of chromosome 5 or 7, monosomy of chromosome 5 or 7, deletions of chromosome 20, additional copies of chromosome 8, loss of chromosome Y, and some structural rearrangements or a complex karyotype with multiple abnormalities. Fluorescence in situ hybridization (FISH) may be used to assess interphase cells for common cytogenetic abnormalities, particularly in cases in which there are insufficient metaphase cells for routine cytogenetic analysis. However, its utility in the setting of a morphologically adequate karyotyping study is limited. FISH may also be of value in the follow-up of known abnormalities. The International Prognostic Scoring System (IPSS), first described in 1997,  allows cases to be stratified on the basis of the percentage of blasts in the bone marrow, the karyotype, and the number of cytopenias (see the Myelodysplastic Syndrome International Prognostic Scoring System calculator). On the basis of the combination of these findings, cases are divided into four risk groups: low, intermediate-1, intermediate-2, and high. These groups were found to have significant differences in overall survival and risk of progression to acute myeloid leukemia. Gadji M, Adebayo Awe J, Rodrigues P, et al. Profiling three-dimensional nuclear telomeric architecture of myelodysplastic syndromes and acute myeloid leukemia defines patient subgroups. Clin Cancer Res. 2012 Jun 15. 18 (12):3293-304. [Medline]. Valencia-Martinez A, Sanna A, Masala E, et al. Mutated ASXL and number of somatic mutations as possible indicators of progression to chronic myelomonocytic leukemia of myelodysplastic syndromes with single or multilineage dysplasia. 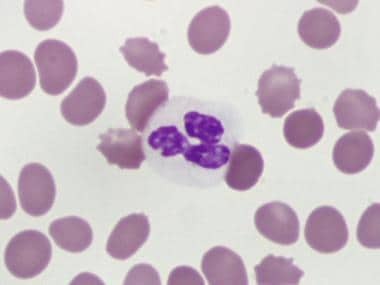 Haematologica. 2017 Sep. 102 (9):e332-e335. [Medline]. [Full Text]. Brunning RD, Bennett JM, Matutes E, et al. Refractory cytopenia with multilineage dysplasia. Swerdlow SH, Campo E, Harris NL, et al, eds. WHO Classification of Tumors of Haematopoietic and Lymphoid Tissues. 4th ed. Lyon, France: IARC Press; 2008. 98-9. Font P, Loscertales J, Benavente C, et al. Inter-observer variance with the diagnosis of myelodysplastic syndromes (MDS) following the 2008 WHO classification. Ann Hematol. 2013 Jan. 92 (1):19-24. [Medline]. Breccia M, Finsinger P, Loglisci G, et al. Prognostic features of patients with myelodysplastic syndromes aged Leuk Lymphoma</i>. 2012 Dec. 53 (12):2439-43. [Medline]. Vardiman JW. Myelodysplastic syndromes, chronic myeloproliferative diseases, and myelodysplastic/myeloproliferative diseases. Semin Diagn Pathol. 2003 Aug. 20 (3):154-79. [Medline]. Horny HP, Sotlar K, Valent P. Diagnostic value of histology and immunohistochemistry in myelodysplastic syndromes. Leuk Res. 2007 Dec. 31 (12):1609-16. [Medline]. Loken MR, van de Loosdrecht A, Ogata K, Orfao A, Wells DA. Flow cytometry in myelodysplastic syndromes: report from a working conference. Leuk Res. 2008 Jan. 32 (1):5-17. [Medline]. Della Porta MG, Picone C, Tenore A, et al. Prognostic significance of reproducible immunophenotypic markers of marrow dysplasia. Haematologica. 2014 Jan. 99 (1):e8-10. [Medline]. [Full Text]. Porwit A, van de Loosdrecht AA, Bettelheim P, et al. Revisiting guidelines for integration of flow cytometry results in the WHO classification of myelodysplastic syndromes-proposal from the International/European LeukemiaNet Working Group for Flow Cytometry in MDS. Leukemia. 2014 Sep. 28 (9):1793-8. [Medline]. Schanz J, Tüchler H, Sole F, et al. New comprehensive cytogenetic scoring system for primary myelodysplastic syndromes (MDS) and oligoblastic acute myeloid leukemia after MDS derived from an international database merge. J Clin Oncol. 2012 Mar 10. 30 (8):820-9. [Medline]. He R, Wiktor AE, Durnick DK, et al. Bone marrow conventional karyotyping and fluorescence in situ hybridization: defining an effective utilization strategy for evaluation of myelodysplastic syndromes. Am J Clin Pathol. 2016 Jul. 146 (1):86-94. [Medline]. Ribeiro HL Jr, Maia ARS, de Oliveira RTG, et al. DNA repair gene expressions are related to bone marrow cellularity in myelodysplastic syndrome. J Clin Pathol. 2017 Nov. 70 (11):970-80. [Medline]. Kharfan-Dabaja MA, Komrokji RS, et al. TP53 and IDH2 somatic mutations are associated with inferior overall survival after allogeneic hematopoietic cell transplantation for myelodysplastic syndrome. Clin Lymphoma Myeloma Leuk. 2017 Nov. 17 (11):753-8. [Medline]. Gangat N, Patnaik MM, Tefferi A. Myelodysplastic syndromes: contemporary review and how we treat. Am J Hematol. 2016 Jan. 91 (1):76-89. [Medline]. Ruutu T, Volin L, Beelen DW, et al. Reduced-toxicity conditioning with treosulfan and fludarabine in allogeneic hematopoietic stem cell transplantation for myelodysplastic syndromes: final results of an international prospective phase II trial. Haematologica. 2011 Sep. 96 (9):1344-50. [Medline]. [Full Text]. Wang R, Gross CP, Maggiore RJ, et al. Pattern of hypomethylating agents use among elderly patients with myelodysplastic syndromes. Leuk Res. 2011 Jul. 35 (7):904-8. [Medline]. [Full Text]. Jonas BA, Greenberg PL. MDS prognostic scoring systems – past, present, and future. Best Pract Res Clin Haematol. 2015 Mar. 28 (1):3-13. [Medline]. Chu SC, Wang TF, Li CC, et al. Flow cytometric scoring system as a diagnostic and prognostic tool in myelodysplastic syndromes. Leuk Res. 2011 Jul. 35 (7):868-73. [Medline]. Kazama H, Teramura M, Kurihara S, Yoshinaga K, Kato T, Motoji T. Peroxiredoxin 2 expression is increased in neutrophils of patients with refractory cytopenia with multilineage dysplasia. Br J Haematol. 2014 Sep. 166 (5):720-8. [Medline]. Germing U, Hildebrandt B, Pfeilstöcker M, et al. Refinement of the international prognostic scoring system (IPSS) by including LDH as an additional prognostic variable to improve risk assessment in patients with primary myelodysplastic syndromes (MDS). Leukemia. 2005 Dec. 19 (12):2223-31. [Medline]. Park MJ, Kim HJ, Kim SH, et al. Is International Prognostic Scoring System (IPSS) still standard in predicting prognosis in patients with myelodysplastic syndrome? External validation of the WHO Classification-Based Prognostic Scoring System (WPSS) and comparison with IPSS. Eur J Haematol. 2008 Nov. 81 (5):364-73. [Medline]. Abbas S, Kini A, Srivastava VM, et al. Coexistence of aberrant hematopoietic and stromal elements in myelodysplastic syndromes. Blood Cells Mol Dis. 2017 Jul. 66:37-46. [Medline]. Disclosure: Received income in an amount equal to or greater than $250 from: Ventana Medical Systems.